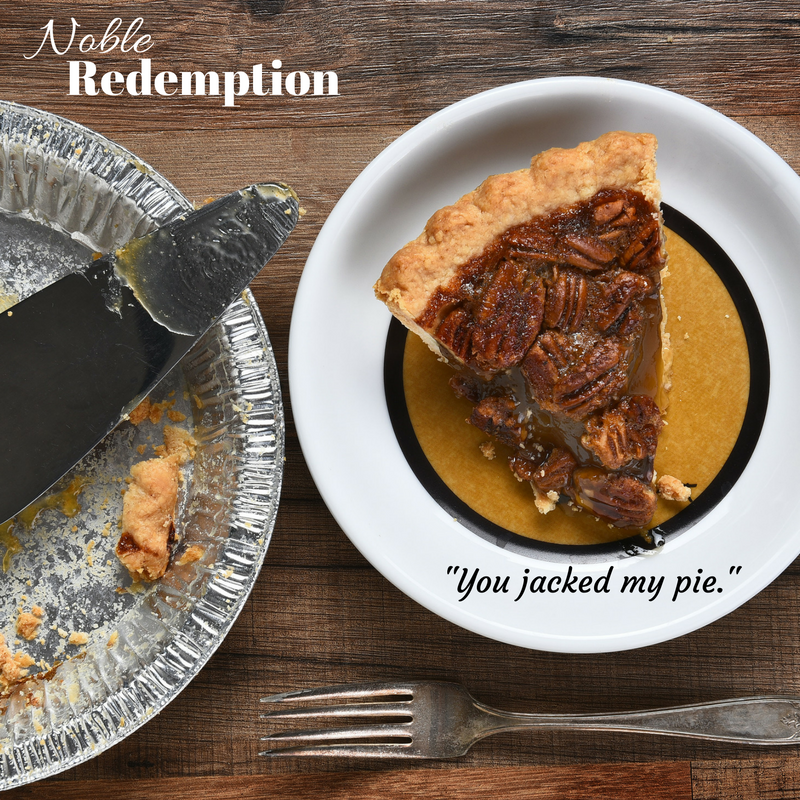 Home Uncategories Sample Sunday: "You jacked my pie..."
Sample Sunday: "You jacked my pie..."
Isabella looked up and saw Stephen standing over her. "I jacked your pie?" she asked. His lip tilted up slightly as he added, "I came in for a slice of pecan pie and she told me that you took the last piece." Isabella remembered that pecan pie had always been his favorite. Apparently that was still true. "Sorry about that," she said with a grin. "I came to get a celebratory piece." "I guess I'll have to settle for another flavor." He was about to turn to head for the counter when Isabella called out to him. "We can split it." He turned back and looked at her and then looked down at the pie. She pushed the plate toward him. "I insist. It's the least I can do after you took me home when my car died." It had been a week since that night and she hadn't seen him since. She'd been busy between her work with Noble Naturals, everything concerning her boutique and the last few renovations on her apartment. She was also getting ready to start working on Tessa's wedding dress. She was exhausted, but happy. When she noticed his hesitation, she picked up the plate and waved it in his direction. "It's a huge slice. Come on," she coaxed. "You know you wanna." She hadn't meant for that to come out sounding so seductive, but it had and there was nothing she could do about it. After another minute of taunting, Stephen walked over and slid into the booth. She handed him the other fork and they dug in. "You mentioned your car, how is the old hag?" Stephen asked. "Hey!" she complained over a mouth full of pie. She yanked the plate closer to her. "What are you doing?" Stephen asked, his fork hovering in the air. He reached out to try and grab the plate and Isabella pulled it even closer to her. "I told you not to bad mouth Dottie. Apologize." Stephen's eyebrows shot up. "You're not serious." "If you want some more of this pie, you'll apologize." She dug in for another piece and watched as his grip tightened on the fork when she slid the fork into her mouth. Isabella's lips spread into a triumphant smile as she pushed the plate back to the center of the table. "She's fine, by the way. Thanks for asking." Stephen shook his head as he stabbed the pie, scooping off a huge piece to shove into his mouth. Isabella caught herself watching him eat. His large full lips wrapped around the fork, his strong jaw tightening and relaxing as he chewed. And finally his tongue...goodness the way his tongue darted out to swipe the corner of his mouth. Isabella blinked and realized that Stephen had been talking. Had they turned the stoves up in the back of the bakery? Why was it so damn hot all of a sudden? "I asked you what you were celebrating?" "Oh..." She wasn't sure if she should even bring it up, considering their past. But it seemed like they were moving forward, if their sharing a slice of pie at the moment was any indication. "The sign for my store went up today." "I saw that when I was driving through town," Stephen said. "Congratulations." He was the absolute last person she would have expected to congratulate her. A warm feeling rushed through her from his words, especially since they sounded genuine. She didn't sense an ounce of animosity in his well wishes. She looked up to find Tessa coming toward her. "Hi!" Isabella said, brightly. "Are you ready to go and do your measurements?" "If I'm interrupting, we can reschedule," she said, looking from Isabella to Stephen. "Don't let me keep you ladies," Stephen said. Isabella stood and he did the same. "Thanks for sharing your pie," he said. "I'll see you ladies later." They watched as he walked off and once he was out of the bakery, Isabella turned to find Tessa staring at her excitedly. "Were just sharing a slice of pie," Isabella said. "Don't make more out of it than there is." She was telling that more to herself than Tessa. Noble Redemption is now live! Get it here.